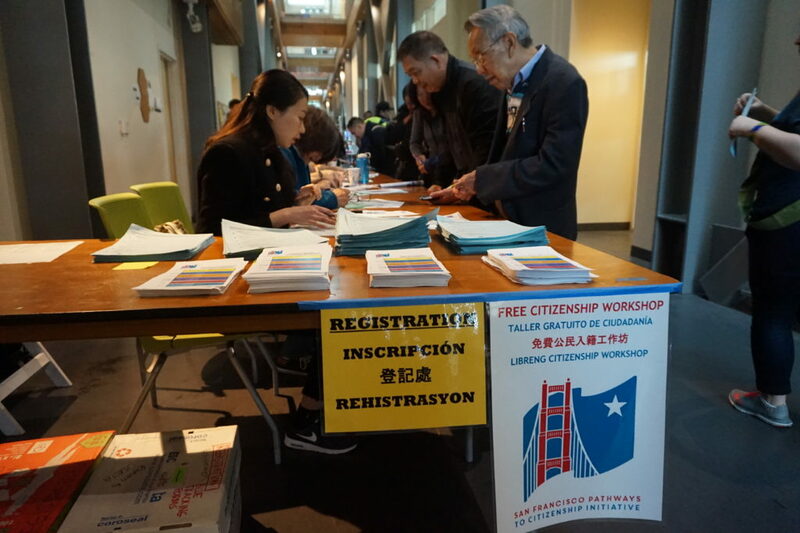 Our initiative provides free large group processing workshops in San Francisco 5 to 6 times a year to help residents prepare their citizenship applications. Workshops are designed to help hundreds of participants complete their entire citizenship application from start to finish, if clients bring all required documents and information. These workshops are the easiest, most convenient way to receive proper legal assistance and get the application completed and reviewed all in one day! 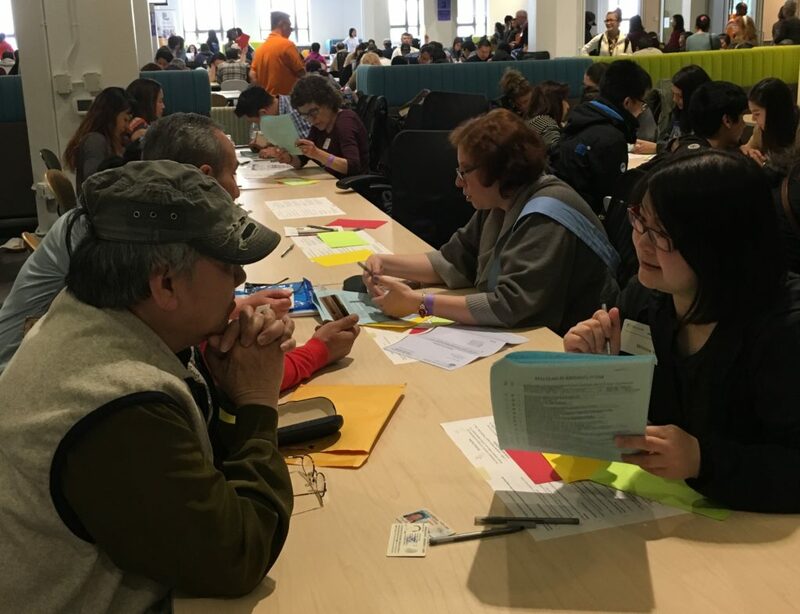 Access to information on community resources including: financial assistance, English learning, citizenship test preparation, civic engagement opportunities and more! This video explains how our large group processing workshops operate, and will help you understand the steps and requirements needed in order to make the most of your day at our workshops. We do not require appointments or reservations to be made before our workshops. Participants will be helped on a first-come, first-served basis. All participants wishing to join the workshop must arrive between 9:30am and 12:30pm in order to guarantee day-of service. The entire application process requires 1.5 to 2 hours, and the entire workshop may take longer. Individuals may even need multiple hours to complete their application and get it reviewed by an immigration expert, depending on their personal situation and language needs. Because there may be a long wait time between registration and receiving assistance, it is important to plan to spend the entire day with us. It may be a good idea to bring food for you and your family, as there is no guarantee of food or refreshments for sale at our workshops. Is this Workshop Best For Me? Our large workshops are best suited for non-complex, basic cases. If you have a case involving disability waiver applications, extensive criminal history, or excessive trips* outside the United States, please contact our immigration provider organizations to schedule a free appointment for an individual consultation with an attorney. *Trips considered excessive include: leaving the U.S. while you were a legal permanent resident for a period of more than 6 months during one trip and/or living for more time outside than inside the U.S. while under legal permanent resident status. When you arrive at the workshop, you will receive a wristband with the time that you will be permitted to start the registration process. All wristbands are given on a first-come first-served basis. 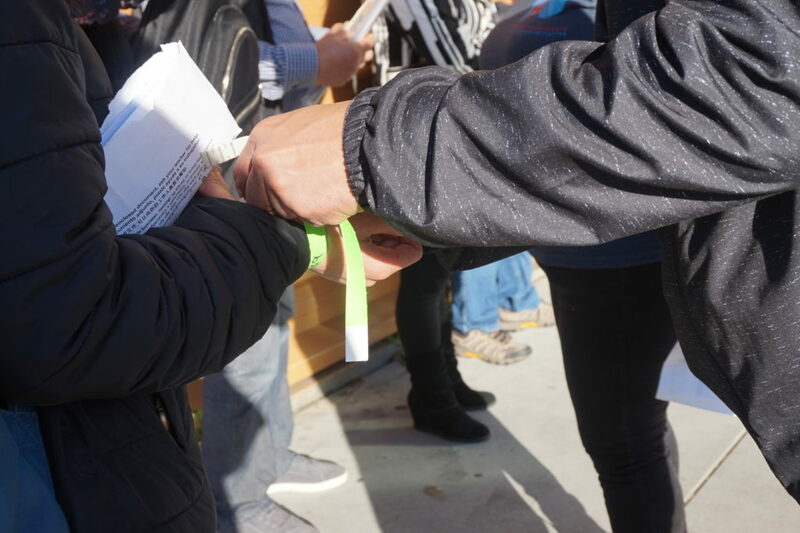 When your wristband registration time arrives, you will start the process by providing basic information and stating your language preference. At registration you will receive a blue participant packet and a workshop participant number. 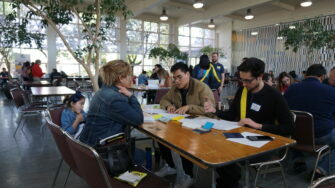 At screening, you will answer a few questions about yourself to determine if you are eligible to apply for citizenship. 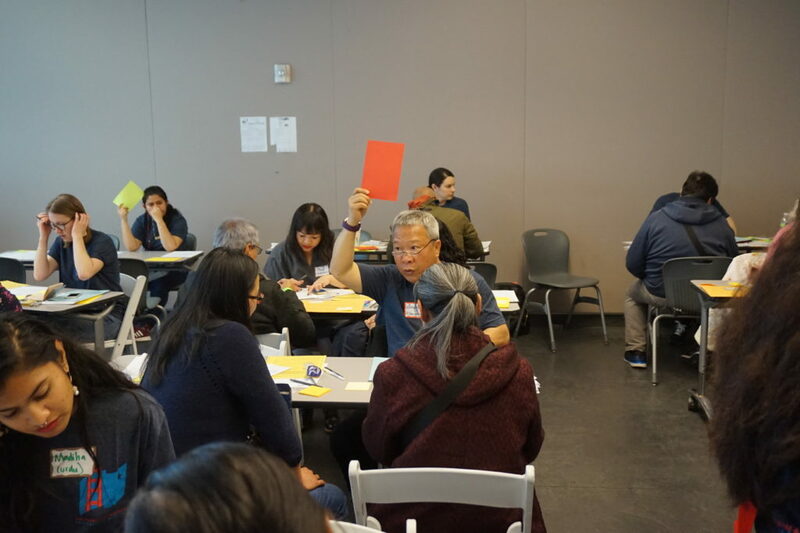 If any issues are flagged in the screening process, you will receive a one-on-one consultation with an immigration expert to determine whether you should apply for citizenship and if you need to obtain further assistance beyond the workshop. Note: This workshop is intended for simple cases. Complex cases will be referred to our immigration provider partners. If you are ready to start your application, you will get one-on-one assistance filling out your citizenship application (N-400) and fee waiver form (if applicable). This station will require the most time. We recommend you prepare in advance by completing this N-400 Preparation Form before the workshop. Note: Applicants will be helped in order of when their was participant package was received at this station and based on the capacity of volunteer staff to provide assistance in the participant’s desired language. All of your forms (citizenship application, fee waiver application, and other supporting documents) are reviewed by an immigration expert to determine if you are ready to submit your application. All participants will check out at this station. If your application is complete and has been reviewed, you will get help packaging your documents in a ready-to-mail envelope. Participants that are ready to submit their applications will also receive instructions about the next steps you need to take in order to mail in and submit your application. 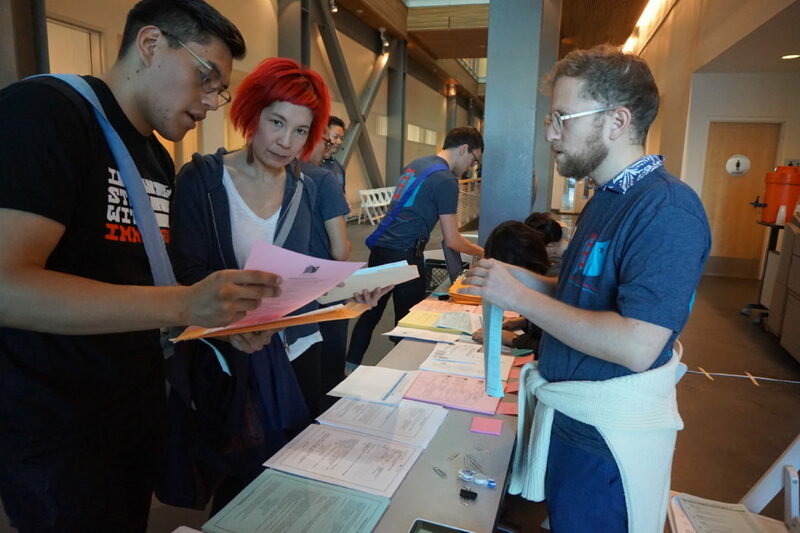 Even if you are not ready or eligible to submit your application, everyone will check out at this station and return their participant packet before exiting the workshop. If your situation is too complicated or we are unable to determine your eligibility to apply for citizenship at the workshop, you will receive a referral for a free office-based consultation with one of our community immigration service providers. Learn about our workshop process in your language!